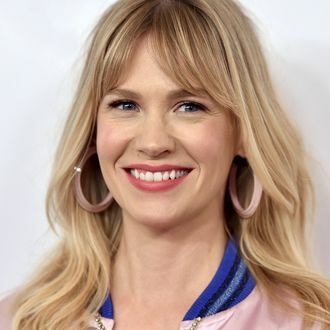 Spiritually, every character January Jones has ever played has been a former figure skater who is taking out her resentment on her children. Now she is actually playing one. The former Betty Francis née Hofstadt formerly Draper has joined the cast of Netflix’s figure-skating drama Spinning Out to play Carol, “a former high-level figure skater who had to forfeit her dreams when she became pregnant with her oldest daughter at a young age.” “The head of the Baker family, Carol fiercely pushes both her girls to become Olympians in order to fulfill the dream she could never achieve herself,” according to a Netflix character description. “Simultaneously, she struggles with personal demons that threaten to ruin her relationship with her daughters, the thing she values above all else.” Samantha Stratton (Mr. Mercedes) created Spinning Out, which stars Kaya Scodelario as Carol’s daughter Kat, who gets injured in a fall, but then “seizes an opportunity to continue her career as a pair skater with a talented bad-boy partner.” Johnny Weir will also be on hand to play a rival skater, and it all sounds soapy and fabulous.